The goal of this interdisciplinary journal is to provide a forum to discuss the knowledge and experience of geo-engineering from fundamentals to cutting edge technologies. It covers a broad area of academic and practical aspects of geo-engineering, including shallow and deep foundation, engineering behavior of soils and rocks, earth retaining structures, deep boring and excavation, slope stability, tunnelling and underground structures, environmental geomechanics, engineering geology, ground reinforcement, geo-energy development, underground energy storage, and the latest experimental, analytical, and numerical methods. The international editorial board, made up of experts and scholars from over 15 countries, guarantees high academic quality of the articles and fast review. The publication costs for International Journal of Geo-Engineering are covered by Korean Geotechnical Society so authors do not need to pay an article-processing charge. 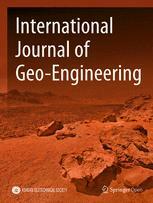 As authors of articles published in International Journal of Geo-Engineering you are the copyright holders of your article and have granted to any third party, in advance and in perpetuity, the right to use, reproduce or disseminate your article, according to the SpringerOpen copyright and license agreement (https://www.springeropen.com/get-published/copyright/copyright-and-license-agreement).